In slalom, giant slalom and the super-G, women’s and men’s performances seem to vary in comparison to each other. However, in downhill, the event that most emphasizes speed rather than making turns, the men consistently run ahead of the women — though female downhill skiers today are faster in general than the men who competed in the late 1970s and earlier. So here’s another question: Is there any reason for women’s Alpine courses to be shorter? 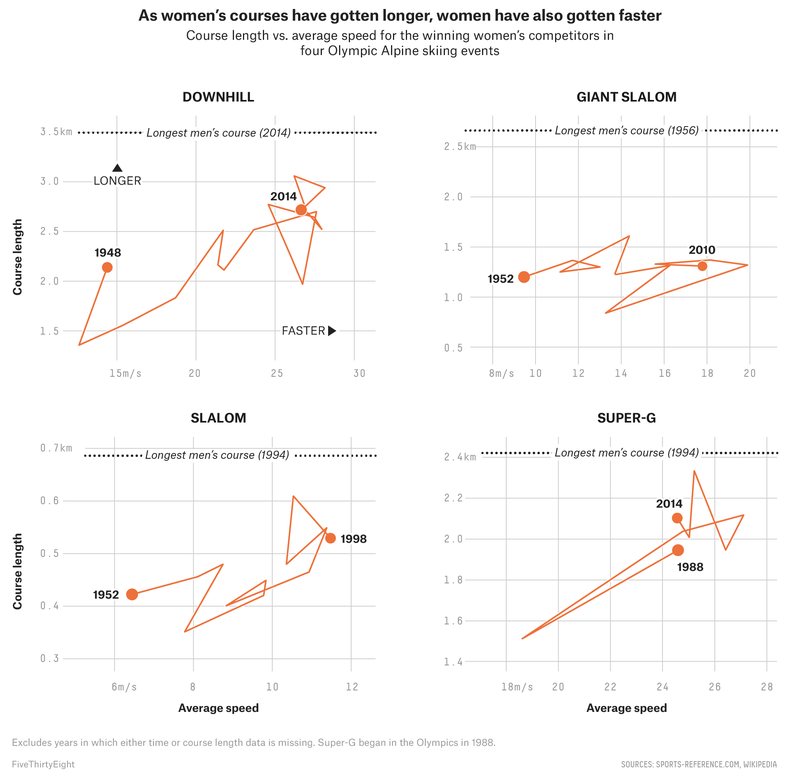 For example, do women go faster on shorter courses, either relative to themselves or to men? (Though that in itself would not be a reason that women’s courses had to be shorter but might give some explanation as to why they are.) To investigate, we plotted average speed versus course length for the winning female competitor in each event for every year. 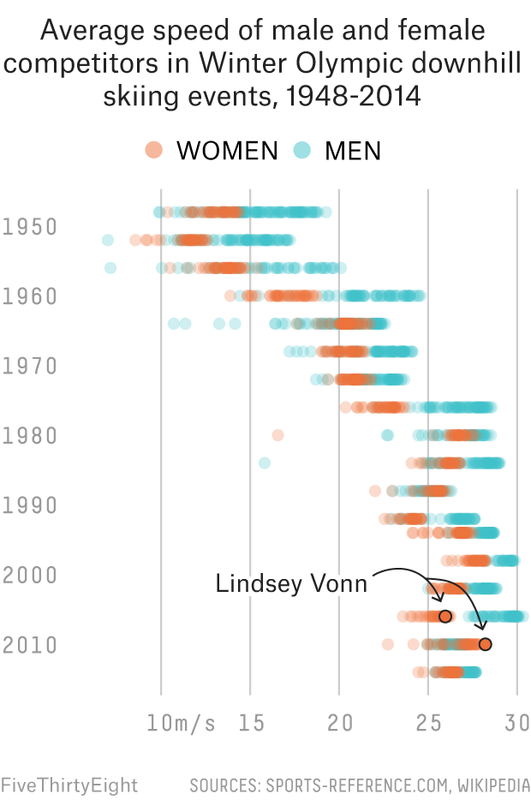 As women have gotten faster, they have also been racing longer distances. It seems that distance is not a limiting factor for female skiers. 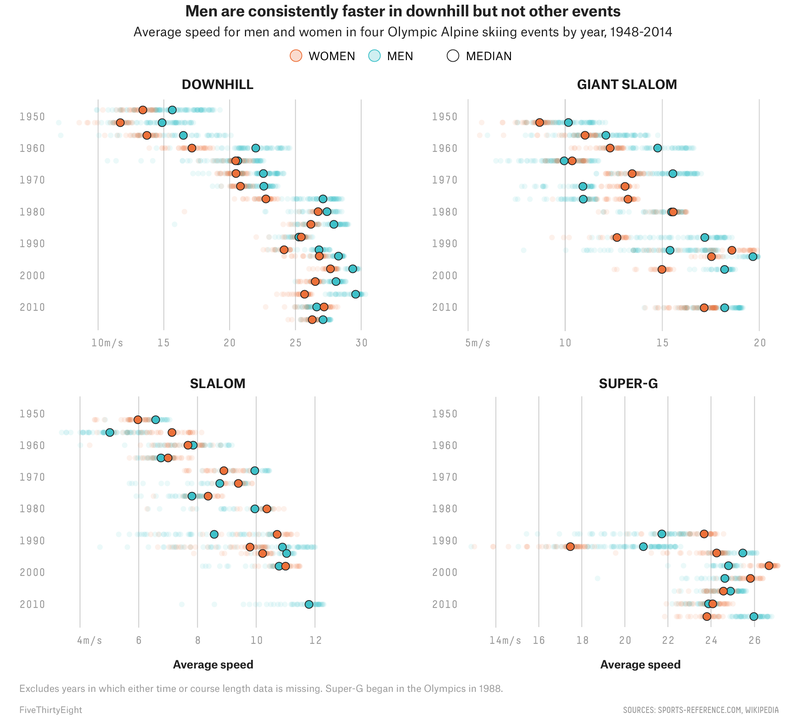 And yet, while the range of women’s speeds is comparable to that of men’s — and even in some events, such as super-G, women have the fastest average speeds in our dataset — in no event have women raced on the longest courses (though in many cases they raced the same distance or greater than men did in other Olympic years). Apart from any questions of inequality, this feature of Alpine skiing makes comparing men’s and women’s performances very difficult. Distance may, in fact, affect average speeds, and requiring separate courses also means that other factors, like gate placement and steepness, will be different for men’s and women’s races. She has 81 wins, only five behind male Swedish skier Ingemar Stenmark, who retired in 1989. There are team events in Alpine skiing that have mixed-gender teams, one of which will be featured in the Pyeongchang Olympics for the first time. But in those events, women are still racing in heats against women and men against men. Even if the FIS were to approve the petition, it probably would not permanently change the rules regarding mixed-gender racing. Rather, it is likely to make a one-time exception for Vonn to race in the men’s World Cup race in November 2018. Excluding combined and team events. We used median speed rather than an average of the field because competitors who did much worse than the field each year had too big an impact on the average. Because Alpine courses are not specific lengths (they follow general guidelines), we needed to know how long each course was so that we could compare speeds from different races, rather than just race times. The results came from Sports-Reference.com, and the course information is from Wikipedia. Neither dataset was complete, so races in which we are missing either times or course lengths are excluded. Curiously, the same is not true for most analogous Summer Olympic events, such as track and field races.